Green Cardamom is used mainly in the Middle East where Gahwa is a popular cardamom-coffee combination. This is an important feature of Arabian hospitality and hence coffee and cardamom is closely associated with each other. Cardamom also features heavily in Biryani, Curries, Pickles, Custards & Spice-blends. This region has the highest per capita consumption of green cardamom in the world. It plays an important role in their culture. Amongst the Middle East countries, Saudi Arabia is the largest market. Its estimated size is about 12000 tons annually and Kuwait is the second highest. The other markets of Qatar and Iraq are also big markets and growing rapidly. The northern tribal region of Saudi Arabia and Kuwait has the highest consumption of cardamom per capita in the world.There is a level of seasonality in the Saudi Arabian imports, imports peaked from September to January. This time period coincides with the high holidays of Islam (i.e. Ramadan and the Hajj). The Western Province around Jeddah gets two high seasons in September (for Ramadan) and January (for Hajj). The Central province around Riyadh has the high season in Ramadan and in the winter months. The Eastern Province around Dammam is a small market and has constant demand year around. Saudi Arabia is the world’s largest import market for cardamom. Coffee consumption appears to be a strong driver of demand for cardamom in Saudi Arabia. Ready-ground cardamom coffee in a retail store in Arabia will typically amount to 5 or 10 grams of ground spice per 250 grams of coffee. However, for special occasions, or to honor a guest with a particular display of generosity, large quantities of cardamom may be used. During the period between Ramadan and Hajj, consumption tends to increase as between one and two million Muslims enter the country during this 3 month period. The vast majority of Saudi Arabian imports comes from Guatemala. In 2006, Saudi Arabia received 94% of its cardamom shipments by volume from Guatemala, while in 2010 this figure fell to 78%. Saudi Arabia imports a smaller percentage from India, although this is increasing with time. 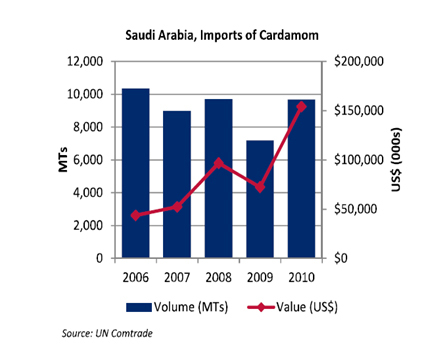 In 2006, Saudi Arabia imported 5% of its cardamom from India, while in 2010, this figure increased to 18%. Overall, Saudi Arabian import volumes fluctuated between 7,188 MTs and 10,330 MTs from 2006 to 2010 while import values rose from US$43.7 million to US$154.1 million over this period.